1• Add 1 teaspoon (5 mL) sugar in 1/2 cup (125 mL) warm water in large bowl. Sprinkle in yeast. Let stand 10 minutes, then stir well. 2• Heat 1 1/2 cup (250 mL) milk to lukewarm. Stir in butter, 2 tablespoons (30 mL) sugar, salt and 1/2 cup (125 mL) warm water. Add milk mixture and 2 cups (500 mL) White Flour to dissolved yeast mixture. Mix until smooth and rubbery. 3• Stir in 2 1/2 cups (625 mL) of remaining flour gradually. If necessary, add more flour to make a soft dough which leaves sides of bowl. Turn out on floured board. Round up into a ball. 4• Knead dough, adding more flour as necessary, until dough is smooth, rubbery and no longer sticky (about 10 minutes). 5• Place in lightly greased bowl. Turn dough to greased top. Cover with greased waxed paper and tea towel. 7• Let rise in warm place (72°-82°F/23°-28°C) until doubled (usually 45-60 minutes or longer if needed). 8• Punch down. Turn out onto lightly floured board and divide into 2 equal portions. Cover and let rest for 10 minutes. 9• Let rise in warm place until dough rises 1 1/2″ (3 cm) above top of pan in centre and corners are filled (45 to 60 minutes). 10• Bake at 400°F (200°C) on lower oven rack for 25 to 30 minutes. Remove from pans immediately. Brush top crust with butter if a soft crust is desired. Let cool on wire racks. 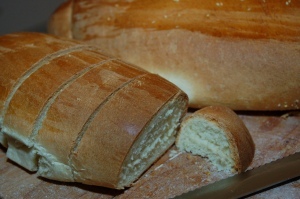 11• This white bread recipe makes 2 loaves.